How old are the practice and ideas of yoga? Hindu traditionalists would say yoga dates back to mythological times and the god Shiva himself. Not quite so, according to the German documentary film “Der atmende Gott”. The film describes the rise of modern yoga through the famous yoga teacher Tirumalai Krishnamacharya and his pupils and children, around the middle of the last century. 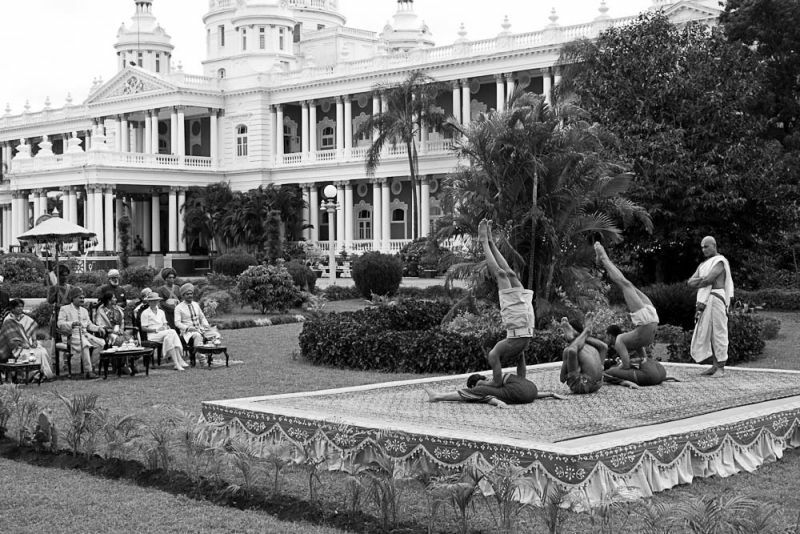 Krishnamacharya was taken under the wings of the Maharaja of Mysore, who was interested in yoga, and he set up a yoga school by the Maharaja´s court in the middle of the 1930s. Later he moved on to Chennai. 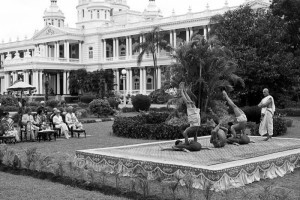 According to the film and its sources (Krishnamacharya´s children and pupils are still alive), asanga yoga was more or less dead as a tradition in India at the time, and Krishnamacharya was a great renewer. On the other hand, the German film maker Jan Schmidt-Garre briefly (alas, too briefly in my opinion) touches the point that modern yoga has for the most part lost contact with its spiritual and existential roots and has simply become body exercises, “circus” with bizarre body postures and with plenty of room for greed and money. The use of breathing in the asanga exercises is never quite explained, and the philosophy of yoga and how the practice can develop one´s understanding of the world is not discussed. The word “meditation” is only mentioned once or twice. For those who find these parts of the film unfulfilling, the meditative aspect of yoga is explained thoroughly in the new book Meditative Yoga: Integrating Body, Breath and Mind by Are Holen and Torbjørn Hobbel. However, the film has lots of great footage from yoga in old times and interesting interviews with veterans of the yoga movement. Something to see for everybody who is interested in yoga. As many as 90.000 have seen the movie in Germany and Austria. Then again 3 million Germans are said to practice yoga. I would certainly recommend the film, even if you don´t understand German. About one third is in German, the rest in English, and it is not difficult to hang on. Very interesting. Is the film shown in cinemas, or sold as DVD? To me it seems that meditative yoga was still part of the yoga wave that reached the West in the late 1960s (and some earlier smaller waves), but that it was often linked to the semi-mystical movements that lost their followings after the 1960s (and early 1970s). Yoga gymnastics and yoga acrobatics took over (though both had existed for a long time before). The book you refer to has kept the meditative orientation, but found a new and more down-to-earth language to express it in. The film has been shown in German cinemas with surprising success, and the cd is easily available on the internet. I was able to find it by searching online-it looks really informative but I haven’t watched it yet. Okay here’s my general take but it’s more of a comment about yoga in general. I really like being able to gain better insight by looking at historical and cultural significance but sometimes I feel like yoga is considered an exclusively Indian concept and that someone practicing today is essentially trying to conform to Indian culture. To me, the framework of yoga is something very universal and timeless, there is just a certain indebtedness to Indian culture for and teaching built off of that universal framework. Sometimes people seem to considered those teachings to be the essence of yoga itself, but I think it is accurate to say it is an interpretation of something that is very innate in humans. I agree that yoga and meditation touch what is common for all humans. That´s the way I understand my meditation technique, Acem Meditation: Built on old traditions, but understood and practiced in a way modern people in the west as well as the east can relate to. There´s nothing particularly Indian about meditating or practicing yoga – it´s just that the traditions started there a long time ago.